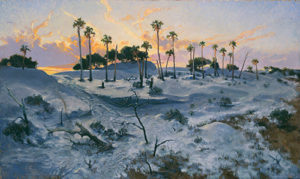 When did you begin painting? I drew and painted some as an adolescnet into my teens, but I started painting and making illustrations full time after college. What are the three most used pigments on your palette? White, blue and yellow. What did you want to be when you were a child? I wanted to travel to capture a world that at the time I believed would transition from what I knew into a crowded place. Part of that was because I was surrounded by rapid development. I tell people I am living the life I envisioned when I was only 13 years old. What are you reading? 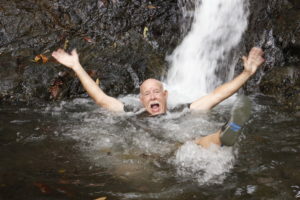 The Lost City of the Monkey Gods by Douglas Preston and On Trails: An Exploration by Robert Moor. What is a defining moment, or couple of moments, of your artistic career? First: a published article in Nautical Quarterly in 1984 with an exhibition and representation by The Grand Central Art Galleries in New York City on 57th St.–at the time it was the oldest representational art gallery in NYC. Second: in 2001 a museum exhibition tour and book titled Charleston in My Time. 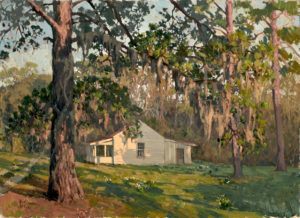 Third: an exhibition at the Telfair Museum in Savannah, Ga.–my birth city–titled A Native Son. Name the top five artists–living or dead– by whom you have been influenced the most. N.C. and Andrew Wyeth, F.J. Mulhaupt, J. S. Sargent, Winslow Homer, Joaquim Sorolla, Anders Zorn, and C.C. Cooper. 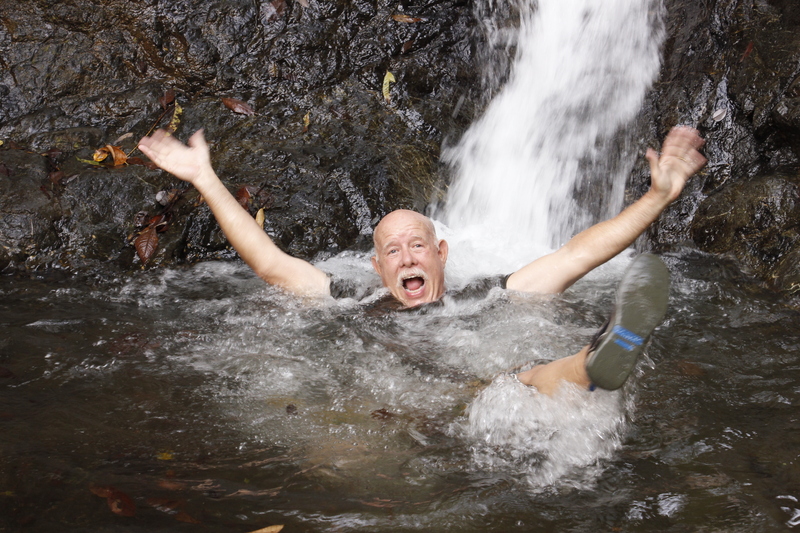 Since this is a travel painting show, if you could go anywhere to paint, where would you go and why? Peru and Chile, because there are still wild places and indigenous culture, and Scotland because I have always wanted to see the land of my ancestors. Anybody want to trade houses? 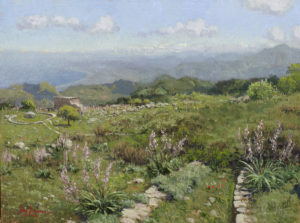 Do you think traveling to paint different areas is important to your growth as an artist? It is paraount to staying fresh, because I don’t want to be a method painter. New places and shapes, atmosphere etc…keeps me observant and forces creative technique. What piece of advice would you give to someone just starting out? Work hard and focus on your specialty. For me I made a decision in the beginning to concentrate on coastal regions to find subject matter and inspiration; it really did not limit my scope or travel. What do you know about Hobcaw Barony? 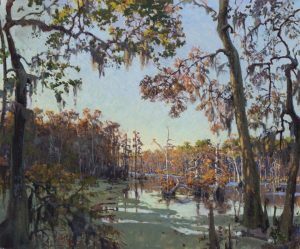 Opening on January 28th The Gibbes Museum in Charleston, S.C. is exhibiting a show of West Fraser’s work, many of the paintings are ones featured in ‘Painting the Southern Coast’. This exhibit is the 9th one-man show of Mr. Fraser’s work, and the 3rd one-man show at The Gibbes Museum. Hobcaw and waccamaw are familiar names in the South Carolina lowcountry. To the native americans, these words defined the area which carries the name– ‘between the river,’ or ‘coming and going.’ Hobcaw Barony was the name given to the largest of the land grants in Georgetown, South Carolina and encompasses the area between Winyah Bay and the Atlantic Ocean. 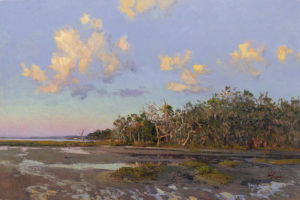 Winyah Bay is fed by several rivers originating in the upstate—the Black, Pee Dee, and Sampit—also named for Native American tribes who populated South Carolina. The colonial land grant known as Hobcaw Barony was established in 1711 and was later subdivided into individual plantations by Lord John Carteret one of King George’s lord proprietors. The area was the second largest producer of ‘Carolina Gold’ rice and was also a well known producer of American caviar and indigo. Georgetown was an important stop on the King’s Highway, which was established by King Charles II as a means for the colonies to better communicate with one another and extended from Charles Towne all the way to Boston. In the early 1900’s successful Wall Street financier, Bernard Baruch, purchased Hobcaw Barony for use as a hunting preserve. The plantation was visited by many of the influential men of the day including Winston Churchill. When Bernard died, he left the property to his eldest child, Isabelle W. Baruch. 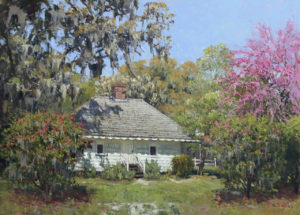 In July of 2016 ‘Painting the Southern Coast: The Art of West Fraser’ was published by The University of South Carolina Press. By October, the first printing had sold out. Extraordinary. 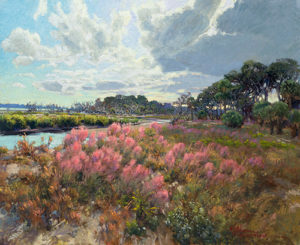 In September of 2016 the Montage Hotel at Palmetto Bluff opened; the hotel houses one of the largest single collections of West Fraser paintings around. When you walk into the lobby of the hotel and look over to the reception desk, you can see the largest painting West has ever completed. ‘Soaring Wings’ was commissioned to be the centerpiece of the collection and is an absolutely stunning piece of work. This too is extraordinary. 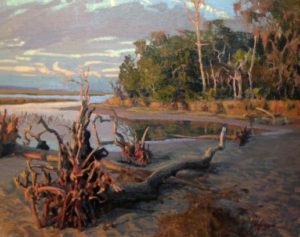 This week, January 28, 2017, the Gibbes opens ‘Painting the Southern Coast,’ a collection of paintings reflecting the book as well as many paintings that represent Mr. Fraser’s mature painting style. This will be West’s third one-man show at the Gibbes, his first was in 1986 (when it was still the Gibbes Gallery of Art), and he was the youngest artist to have a one-man show. He now has another first, this will be the first show of a single living artist since the museum re-opened in May of last year. And as director Angela Mack said, it better be good. We at West Fraser Studio and Helena Fox Fine Art think it’s better than good, we think it’s extraordinary. If you are a member of the museum, please join us on Friday evening at 7pm for a preview of the show. Please stay tuned to our website, Facebook page (West Fraser Studio), Instagram (@westfraserstudio) and email (info@westfraserstudio.com) for information about West’s guided tours of the exhibit happening throughout the run of the show. Thank you to Adam Parker and The Post and Courier for a well written article about both West Fraser’s and Jacob Lawrence’s exhibit at The Gibbes Museum. Do you like to paint? Do you like to sip cocktails while sitting on the porch of a beautiful inn on an island? Well then, have I got a plan for you! 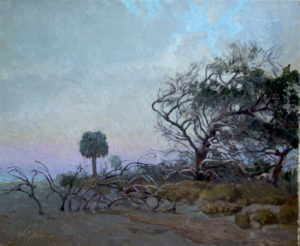 West Fraser will be giving a painting workshop on Cumberland Island, Ga. in February. Explore Cumberland with West and enjoy the hospitality of The Greyfield Inn and take home a painting of your own. 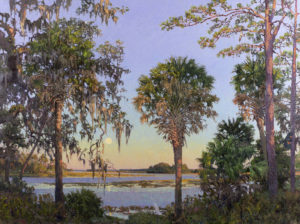 The four day workshop starts off with an oyster roast with the artist and a book signing of Mr. Fraser’s newest book ‘Painting the Southern Coast’ published by USC Press in July 2016. West will be giving demonstrations as well as you will have time to paint and learn from the artist. For more information about the workshop, please follow the link below. For more information about the workshop and accommodations please follow the link below. Join us for a book signing and artist talk on September 22, 2016 at the Charleston Library Society. For more information on the evening, please go to here. 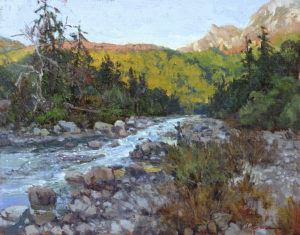 There is a lot of talk about plein aire painting, but what exactly does it mean? Borrowed from the French, to paint ‘en plein aire’ literally translates to ‘open air,’ it refers to painting outside, on location, in all kinds of weather. And into the fray we go…. Things here at West Fraser Studio are busy. Busy with new commissions, busy with a new intern, busy with building a bigger, better website, and busy with planning a book tour. Have you ever walked past this door on Broad Street and wondered what lay beyond? On Thursday October 29, 2015 you can come on in look around and have a glass of wine and a nibble of food as well.